For cleaning up automotive tools and equipment, mechanics rely on the highly absorbent, extra thick JUMBO RHINO ROLL to wipe up grease, oil and dirt. 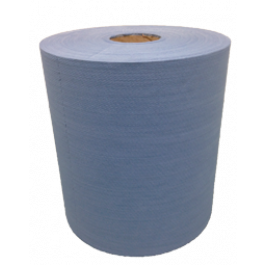 This very useful general workshop rag is tough, durable and disposable, and made from high concentrations of pulp wood together with a degree of polypropylene, which combined gives the wiper maximum absorbency and its low linting, strength and durability features. Mechanics and automotive businesses prefer these heavy-duty absorbent cloths to recycled T-shirt rags when performing automotive maintenance, because in addition to being thick and absorbent, they are also very low linting and so do not leave behind fluff or cotton threads on surfaces after wiping, which can sometimes occur with T-Shirt rags. This versatile wiper has many uses, including cleaning grease, grime, hubcaps as well as surfaces such as work benches and other places in mechanical workshops. They are also ideal for tool cleaning, surface preparation and sanding, as well as valeting and detailing tasks. This low linting quality and ability to work well with cleaning fluids and detergents without falling apart makes them ideal for washing, cleaning, valeting and detailing vehicles, vans, buses, trucks, cars, taxis, as well as boats and campers. The rolls are portable and easy to freight and store (floor stands are available, if required). Each roll has 475 large wipers (32cm x 34cm), each with a good degree of perforation, making them easy to tear off and use individually, which minimises wastage. Using JUMBO RHINO ROLLS gives the great result in automotive care that one would expect from a quality wiper, with a lot less effort and cost than other cloths and rags. These oil absorbing cloths provide a superior performance and make a "no brainer" alternative to other cloths and rags that might leave surface grime, dirt and lint on the car's surface. So, if you are not already using JUMBO RHINO ROLLS, add them to your next order of automotive cleaning supplies, and enjoy cost savings and the quality benefits that these speciality automotive thick wipes provide, including absorbency, low linting and durability!